This is the most important page on this website. Please read this entire page because I’m going to give you the secret right up front. There is a crucial difference between what I teach and what everyone else does, and it is why my students get faster results and eventually achieve their goals on the saxophone rather than staying stuck in a rut or worse, give up. It will work for you too, absolutely guaranteed. I know this because this secret can be found in all of the music you listen to, love and would like to learn to play. We are going to start out by learning a simple group of 5 notes called the pentatonic scale. I’m going to show you how you can get incredible mileage out of these 5 notes and before we ever even talk about all the other complexities of music, we can learn to play popular song melodies and improvise solos that sound great. Have a look at Gary’s recording credits here. If someone with a resume like that can play solos with only 5 notes, then so can you! Only notes from the pentatonic scale were used to build that solo as well. Not only can this group of notes be used to play solos like the ones you just heard, it is also the foundation for countless melodies throughout the history of every musical style. Believe it or not, every note you just heard was from the pentatonic scale that I’m about to show you. The reason has to do with the standard, conventional way music has been taught for centuries. In my own quest to learn how to play the music I love, I went to a 4 year music school studying classical and jazz saxophone performance, then did a 2 year masters degree in jazz performance where I learned all the intricacies of music at a very deep level and no one ever told me the secrets I’m about to reveal to you. Everyone, including myself, learns to play saxophone by one of 2 approaches, which are basically the same thing. Do I really need to know all of this to play the thing I started out wanting to learn? That was the legendary B.B. King who was one of my personal guitar heros along with the other gentlemen seated next to him. Jimmy Vaughan (SRV’s brother), Robert Cray, and Eric Clapton. And yes, once again, what you just heard was played using exclusively the 5 notes I’ve been talking about. When you get a minute watch the full version of that video. They each take a solo and about 98% of the notes they all play in all of their solos are from… you guessed it, the amazing, versatile and not to mention bluesy, pentatonic scale. If this all sounds good to you so far, it gets even better. So if you don’t know how to read music, great, it just makes what we’re trying to do more complicated. If you do already read music, that’s fine too, but I’m going to ask you not to, and for this system to work, you will have to trust me and put the sheet music away for a while. So, if you’ve been wanting to learn to play music like you heard in the above audio examples, but felt that it was out of your reach, or too complicated, you were wrong. Many of my students are able to play familiar songs by ear without looking at any sheet music within the first hour of taking my Pentatonic Foundation Course. Playing completely improvised solos follows shortly after. This system works for saxophone players of all levels. If you are interested, I’d like to reveal to you my simple system for learning how to play tons of music like the examples you heard on this page and more, entirely by ear. Jay. 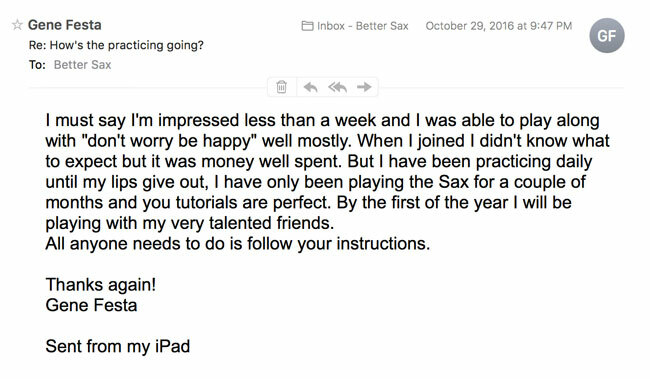 ..I would really love to learn more about saxophone. .I have the instrument but no teacher..I will be grateful if u get to tutor me ..
Ownen, I hope you learn something valuable in this course. thank you Jay for your courses ! It is a real happiness to do what you teach . the words are simple , clear , easy to understand and play . Thank you Pierrette. I’ve got more on the way. I appreciate this course offer (along with your other clips, classes, etc.) I have been playing by ear since I started playing sax (& flute), but I am sure this will help me to improve. I have a gig this weekend that I am preparing for, but when that is done I should have a little more time and will sign up for the course. Your exercise pages will be also be a help for me to learn how to read better. Thanks.